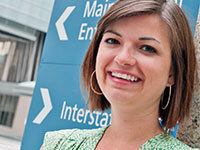 Katie Curran’s passion for social justice through public health service has taken her all over the world. A month after earning her degree, Curran started consulting for the World Health Organization's HIV department in Geneva. "It has been a very interesting experience with great exposure to global public health policy and guidance," Curran says. "My training in epidemiology has been invaluable as I help review and interpret study findings, scientific evidence, etc." Following her work in Geneva, Curran completed a two-year, post-doctoral fellowship in applied epidemiology at the U.S. Centers for Disease Control and Prevention's Epidemiological Intelligence Service program. Today, Curran is an epidemiologist working in the CDC’s Global Tuberculosis (TB) Branch, a division of Global HIV/AIDS and TB.